Paul Schreyer is a 9/11 Truth researcher and author living abroad. He has penned some of the very best exposé’s and background ever published within the 9/11 Truth Movement. The following research paper shows WHEN, HOW and WHY Cheney and the PNAC clan fundamentally over-ran our democracy, went to war, and executed what Zbigniew Brzezinski, of the CFR, had outlined in his book Grand Chess Game. A book that called for controlling petroleum supplies [via controlling the geography] in the mid-eastern region as being key for world dominance for THE NEW AMERICAN CENTURY. The full report can be seen on www.911blogger.com. You will notice his clumsiness in writing the English language [mine too]. My personal position is that COG was instituted on 9/11/2001 and that it has never been removed. This explains why so few people have been indicted for violating our “usual laws”…and why "our rulers" seem "to be flying in the face of the constitution". Its because under COG, they no longer exist as we have known them. Peter Dale Scott considers COG to be “Change Of Government”…and I think that he is correct. Somebody else may be guiding Obama, as well as the rest of the government...and my best guess is that they are connected to our MONSTEROUS five sided building along the Potomac, the doubled [trebled if you count black ops budgets] and of course, all the Intel agencies. AT LAST, someone has built a bridge between Cheney’s “Energy Meetings” and the required “invasion” of the middle east…via the 9/11 attacks. To the youth amongst us, it’s a simple DUHHH! Rumsfeld, born 1932, chose political science. He was a rather small and sturdy person, but with energetic charisma. While at university he engaged in sport and was known as a succesful ringer. Later Rumsfeld went to the Navy to become a pilot. The Navy hat paid a part of his scholarship. At the end of the 1950s he eventually started his career in politics as assistant of a congressman. Meanwhile father of a young family, and following a short intermezzo at an investment bank, Rumsfeld himself ran for Congress, at the age of 29 only. In the mid of the 1970s politics in America went through a time of upheaval. The economy was in crisis. With the lost war in Vietnam, nationwide student protests and Watergate the leadership of the superpower showed internal signs of decay, culminating in Nixon´s resignation in 1974. Successor Gerald Ford appointed Rumsfeld to become chief of staff with Cheney shadowing him closely as his deputy. At this time the White House also developed a secret emergency plan, put in action however only at September 11th, 2001 for the first time. The plan was secret also because it bypassed the constitution. Since the presidential succession was already explicitly fixed by law: if the president died, the vice president took over, then followed by the speaker of the house, after him the longest serving senator, then the secretaries of state, treasury, defense and so forth. However the COG plan simply ignored this well balanced constitutional arrangement. In an emergency it called instead for a president who was not democratically legitimized at all. After the defeat of the Republicans in 1992 Cheney also considered an own presidential campaign. Yet soon he had to realize that he lacked support. Instead he moved to the private sector, becoming CEO of Halliburton, one of the world´s biggest oil supply companies. As secretary of defense he already had build connections to the firm, leading later to multi-billion-dollar contracts with the Pentagon. The new job now also filled Cheney´s pockets, making him a multimillionaire as well. Finally, in September 2000, two month before the presidential election, PNAC published a lengthy strategy paper, giving policy guidance to the next administration. “Rebuilding America´s Defenses” was its programmatic title and it analysed principles and objections of a new defense policy. After George W. Bush´s inauguration in January 2001 the members of this circle secured important posts in the new administration. Cheney turned into the leading figure. This had become apparent well before the election. As early as April 2000 Bush had asked him to handle the selection of his vice presidential running mate. In the end Cheney had all but proposed himself for the job. (21) Meanwhile the workaholic had survived three heart attacks. One of his first recommendations to Bush was the appointment of Rumsfeld, almost 70, as secretary of defense. Deputy of his old associate became Paul Wolfowitz, a hardliner who had already worked for Cheney as chief strategist in the Pentagon at the beginning of the 1990s. 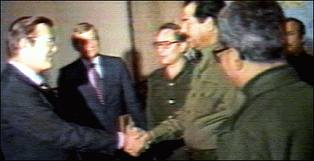 Compared to these men president Bush himself was a newcomer in Washington. 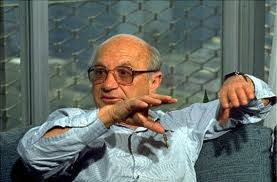 Though he was blessed with political instinct and a very practical intuition, he could hardly hold a candle to these old hands intellectually. Later it was disclosed that Cheney´s energy task force had also secretly examined a map of the Iraqi oil fields, pipelines and refineries along with charts detailing foreign suitors for oil-field contracts there. Again, the date was March 2001. 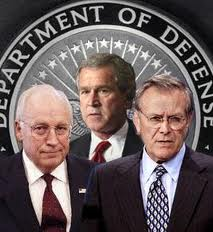 Untill today it´s undisclosed how the COG plan was refined in detail under Cheney´s direction in 2001. 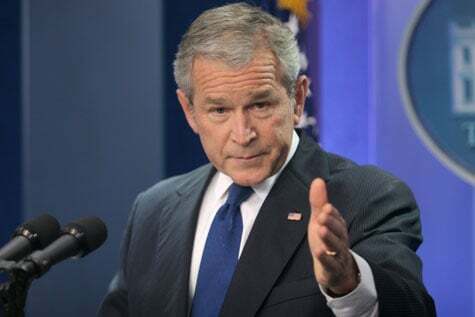 However the following is apparent: in the months leading to 9/11 Cheney linked anti-terror and emergency management measures with national energy policy. Commissions working on both issues were handled by him simultaneously. This connection anticipated the policy after 9/11, which could be summarized as using a terror attack as rationale for extending the power of the executive and waging war to seize control of world regions important for energy supply. Two influential opponents of these legal changes were Tom Daschle, Senate Majority Leader, and Patrick Leahy, head of the Senate Judiciary Committee. Both received letters with spores of deadly anthrax.